As part of its continued effort to upgrade its editing tools and make life a lot easier and manageable for its users, GoPro has announced a new feature that will be accessible via its mobile app and certain GoPro cameras. 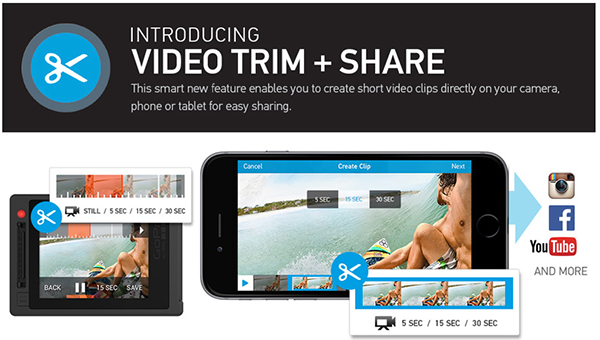 The new video editing feature is built directly into the playback functionality of the camera and the mobile app, and aims to provide users with a quick and easy way to create short video clips that can then be shared effortlessly with family, friends, or colleagues, without the need to pass on a huge clip ladened with time markers. The recently announced feature – dubbed Video Trim + Share – falls under GoPro’s efforts to afford its users with the ability to “effortlessly share memorable moments captured on GoPro devices”. Previously, if an individual wanted to share some captured media with someone, but place an emphasis on only a small portion of that video, it was necessary to add time markers and stamps to denote the area which needed viewing, but thanks to the latest trimming and editing feature, this means that is no longer necessary. Pressing the Trim icon during playback mode will now let the user choose a 5, 15, or 30 second clip from any of the recorded content. That chosen subsection of the video can then be saved for immediate playback and sharing without the need to transfer the entire video file. This on-camera trimming functionality will be available on the HERO4 Black with LCD BacPac, HERO4 Silver, and HERO+ LCD model GoPro cameras, which will let the user save the trimmed file directly to a media card. The in-app version of this functionality will allow instant saving to the device Camera Roll for all Wi-Fi enabled GoPro cameras, including the latest GoPro Hero4 Session. It’s pretty much a given these days that anyone wanting to record any action footage in extremely high-quality will utilize the services of a GoPro camera. The powerful little cameras are extremely popular with cyclists, motorcyclists, and extreme sports fans indulging in activities such as mountain biking, snowboarding and other adrenaline sports. This latest edition to the capabilities of the GoPro will surely appeal to those individuals who are familiar with the frustrations that come attached with sharing large video files with friends and family. 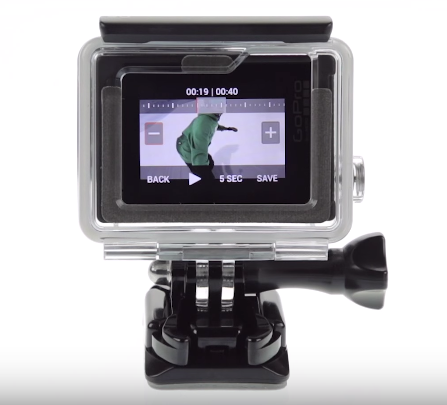 Check out the two videos below, on how to get started with this latest feature on your GoPro camera and mobile app. You can get the latest app update for GoPro App for iOS and Android from the App Store and Play Store respectively.